THE EUROPEAN COURT OF JUSTICE HAS RULED THAT INTERCHANGE FEES ARE PERMITTED IF THEY PROVIDE BENEFITS TO MERCHANTS. 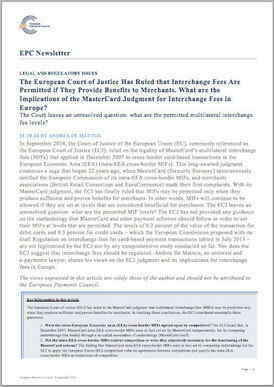 WHAT ARE THE IMPLICATIONS OF THE MASTERCARD JUDGMENT FOR INTERCHANGE FEES IN EUROPE? MIFs are the fees paid by an acquirer, i.e., the bank or payment service provider of a merchant, to the issuer, i.e., the bank or payment service provider of the cardholder, for each transaction, to compensate the issuer for the services it provides to the merchant in each transaction. In a two-sided market like the card payment business, card schemes balance the interests of both sides, merchants and cardholders, so that each party pays its fair share of the costs for the benefits it receives. This is done through the MIF. Merchants receive a wide variety of benefits from card acceptance, including more customers, higher sales per customer, the ability to sell via the internet, reduced costs of cash, (e.g. cost of handling, theft, loss, counterfeit), quicker check-out, automated points of sale, etc. In addition, the merchant is guaranteed payment when accepting cards – the merchant gets paid even if the cardholder fails to pay for the transaction. Issuers provide the bulk of these merchant benefits. The MIF provides revenues to issuers for the services and benefits they provide to merchants. Without the MIF, or if the MIF is set too low, merchants extract value from the scheme without paying for it. This results in consumers paying higher fees, (or receiving fewer benefits), to compensate for the value merchants extract without paying any compensation. Cards become more expensive or less attractive for consumers as issuers charge higher consumer fees or reduce consumer benefits to make up for the revenue lost when merchants no longer pay for the benefits they receive. In September 2014, the ECJ ruled on the legality of MasterCard’s MIFs that applied in December 2007 to cross-border card-based transactions in the European Economic Area (EEA) (intra-EEA cross-border MIFs). This long-awaited judgment continues a saga that began 22 years ago, when MasterCard (formerly Europay) spontaneously notified the European Commission of its intra-EEA cross-border MIFs, and the merchants associations British Retail Consortium and EuroCommerce made their first complaints. Initially, the Commission dismissed those complaints as groundless. Interchange fees were considered perfectly legitimate and compliant with European Union (EU) competition rules. Then, in 2002 in a case concerning Visa, the Commission decided that MIFs were compliant, provided their levels were based on issuing costs. Issuing costs methodologies were developed by card schemes following this approach. In 2007, as a result of the increased lobbying by merchants in Europe and throughout the world, the Commission changed its approach and adopted an infringement decision against MasterCard intra-EEA cross-border MIFs – despite the fact that those MIFs were based on issuing costs – because there was no sufficient evidence that the levels then in force were beneficial enough for merchants. With its September 2014 judgment, the ECJ has finally confirmed the Commission’s 2007 decision and ruled that MIFs may be permitted only when they produce sufficient and proven benefits for merchants. 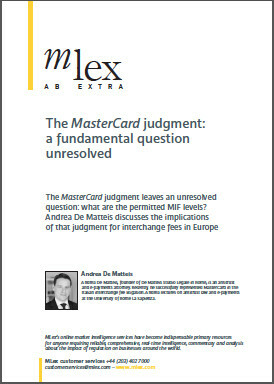 In reaching these conclusions, the ECJ considered essentially three questions: (1) whether the intra-EEA cross-border MIFs were agreed upon by competitors; (2) whether they restricted competition or were objectively necessary for the functioning of the MasterCard scheme; and (3) whether they could be exempt from the application of the competition rules on the basis of efficiencies. 1. Were the intra-EEA cross-border MIFs agreed upon by competitors? The ECJ found, firstly, that, in December 2007, MasterCard intra-EEA cross-border MIFs were in fact not set by MasterCard independently, but by competing undertakings (the banks) through a so-called association of undertakings (MasterCard itself). The ECJ considered MasterCard to be an association of undertakings because – despite the initial public offering (IPO) on the New York Stock Exchange in 2006 – it continued to be an institutionalised form of coordination of the conduct of the participating banks. Based on that assessment, the ECJ dismissed MasterCard’s defence that after the IPO it became a public company owned by a large and dispersed number of non-banking shareholders. MasterCard pointed to the fact that MasterCard is a commercial entity separate from its banking customers, pursuing its own commercial interests and required to act in the interest of its public shareholders, not the banks. MasterCard also unsuccessfully argued that it could not be qualified as an association of undertakings because there is no commonality of interests among its customers in higher MIFs: issuers are interested in receiving higher MIFs, while acquirers are interested in paying lower MIFs. 2. Did the intra-EEA cross-border MIFs restrict competition or were they objectively necessary for the functioning of the MasterCard scheme? The finding that MasterCard intra-EEA cross-border MIFs were in fact set by the banks led the ECJ to apply the EU competition rules on agreements between competitors and qualify the intra-EEA cross-border MIFs as restrictions of competition. According to the ECJ, the intra-EEA cross-border MIFs restricted competition, because their effect was to set a floor for the charges imposed by acquiring banks on merchants (merchant service charges). The ECJ held that MasterCard’s intra-EEA cross-border MIFs did not escape the competition rules on the basis of previous case-law regarding ‘objective necessity’. According to that case-law, those restrictions that are objectively necessary for the operation of the system are allowed. The ECJ considered that the MIFs were not objectively necessary for the MasterCard system. On the basis of a narrow interpretation of previous case-law, the ECJ ruled that the fact that a given operation is simply more difficult to implement or even less profitable without the restriction concerned cannot be deemed to give that restriction the ‘objective necessity’ required in order for it to be classified as ancillary and escape the competition rules. The adverse consequences for the functioning of the MasterCard system in the absence of the MIFs do not mean that the MIFs must be regarded as being objectively necessary, since the system is still capable of functioning without those fees. MasterCard claimed instead that four-party payment systems cannot operate without default settlement terms between banks issuing cards to consumers and those acquiring transactions for merchants, which requires the setting of a default interchange fee (whether positive, negative or zero). 3. May the intra-EEA cross-border MIFs be exempt from the application of the competition rules on the basis of efficiencies? Finally, the ECJ confirmed that MasterCard’s intra-EEA cross-border MIFs in force in December 2007 could not be exempt from the application of the competition rules on the basis of efficiencies. According to the ECJ, MasterCard failed to demonstrate to the required standard that merchants receive appreciable objective benefits from MIFs. Therefore, the ECJ deemed that it was not even necessary to examine the advantages flowing from the MIFs for cardholders – as claimed by MasterCard – since such advantages could not, by themselves, compensate for the lack of evidence of sufficient benefits to merchants. This is so even if – as recognised earlier by the General Court of the EU in the MasterCard v. Commission judgment of 24 May 20121 – cardholders were to bear much higher costs due to the MIF being removed or reduced. Specifically, the General Court recognised that “a reduction in the benefits conferred on cardholders or the profitability of the card issuing business might be expected in a system operating without a MIF”, and a reduction in interchange fees could lead “to an increase in the costs charged to cardholders or to the reduction of certain benefits”. An unresolved question: what are the permitted MIF levels? The judgment leaves open the possibility that MIFs may be exempt from the application of the competition rules if payment schemes are able to demonstrate that there are appreciable objective advantages for merchants flowing from the MIFs that are sufficient to compensate for their restrictive effects. In other words, MIFs will continue to be allowed if they are set at levels that are considered beneficial for merchants. The ECJ has not provided any guidance on the methodology that MasterCard and other payment schemes, (e.g. Visa and domestic schemes), should follow in order to set their MIFs at levels that are permitted. The levels of 0.2 percent of the value of the transaction for debit cards and 0.3 percent for credit cards – which the European Commission proposed with the draft Regulation on interchange fees for card-based payment transactions (IF Regulation) tabled in July 2013 – are not legitimised by the ECJ nor by any comprehensive study conducted so far. Nor does the ECJ suggest that interchange fees should be regulated through legislation. The Commission has tried to answer the question regarding what MIFs levels are permitted by resorting to diverging and conflicting approaches over the years. After giving its blessing to issuing costs methodologies in 2002, the Commission disallowed them in 2007 and embraced a new and untested methodology to identify the permitted MIFs levels, called ‘tourist test’, or ‘merchant indifference test’. This new methodology is said to have been first used during the Interim Arrangement of April 2009 between MasterCard and European Commissioner Neelie Kroes after the Commission’s decision on MasterCard’s cross-border interchange of December 2007. Due to its complexities, however, there are no conclusive results of this methodology, which is highly controversial. According to the merchant indifference test theory, the MIF that meets this test is set at such a level that the merchant service charges paid by the merchant is at the same level as the ‘avoidable’ cost of cash to the merchant. In other words, the Commission seeks to set the MIF at a level at which the merchant is ‘indifferent’ as to whether she or he receives a card or cash payment. It is not surprising that the merchant indifference test is a controversial tool for setting MIF in that it focuses solely on the merchants’ indifference and excludes the consideration of consumer interests in a properly set MIF. Since any MIF impacts consumers and merchants at the same time, it is likely that the merchant indifference test will continue to attract considerable criticism even if reliable data is obtained to ensure merchant ‘indifference’. There is in any event today no reliable and accurate data at hand to apply this methodology. The first Commission’s attempt to obtain some reliable data on the merchant indifference test dates back to a study that the Commission awarded in April 2009. MasterCard sought access to the documents related to the study on the basis of the EU Transparency Regulation, but without success. On 9 September 2014, two days before the ECJ’s judgment in relation to MasterCard’s MIFs, the General Court of the EU, following an appeal by MasterCard, annulled the decision by which the Commission refused to disclose those documents. In June 2012, the Commission published another call for tender for the conduct of a survey on merchants’ costs of processing cash and card payments. Seven months later, while the studies were still ongoing, despite the absence of reliable data, the Commission presented its proposal for the IF Regulation, arguing that the envisaged MIF caps – 0.2 percent of the value of the transaction for debit and 0.3 percent for credit – were set on the basis of the merchant indifference test. Only on 19 February 2014, seven months after it had introduced its proposal for the IF Regulation, did the Commission publish the merchant indifference test preliminary results. These preliminary results are extremely low: the MIFs that comply with the test are 0.11 percent of the value of the transaction for debit cards and 0.15 percent for credit cards. These levels are even below the proposed MIF caps under the draft IF Regulation. When introducing these results, the Commission admitted that the process of collecting the data from merchants proved to be a very difficult and lengthy task. The Commission indicated that there are several caveats to the preliminary results and that a broader analysis is necessary. The survey concerned only ten out of 31 EEA countries. Only 254 large merchants were satisfactorily surveyed. Only large merchants (above 20 million euros in turnover) were surveyed. The survey concerned only face-to-face transactions (e-commerce ones were excluded). Smaller merchants will be surveyed in a second phase of the project, which should target 2,000 merchants in the same ten countries. It has not been ruled out that the results from the smaller merchant survey may alter the preliminary results. It is clear that at present the Commission does not possess the necessary data to identify the MIFs permitted levels under the competition rules nor those that would be permitted under any legislative intervention. This is a fundamental flaw in the pursuit of antitrust enforcement by the Commission and national competition authorities. It is possible, therefore, that pending the approval of the IF Regulation, national competition authorities, regulators or judges could apply higher levels if the evidence in that particular country shows that merchants will receive sufficient benefit from such higher levels. This and other reasons should lead national competition authorities not to take new action against payment schemes, but instead to wait for the approval of the IF Regulation, which remains under review by the EU co-legislators, i.e. the European Parliament and the Council of the EU representing EU governments. Andrea De Matteis is an antitrust and e-payment attorney and named partner with De Matteis Studio Legale in Rome. The firm has represented MasterCard in successfully overturning a decision of the Italian competition authority on interchange fees.